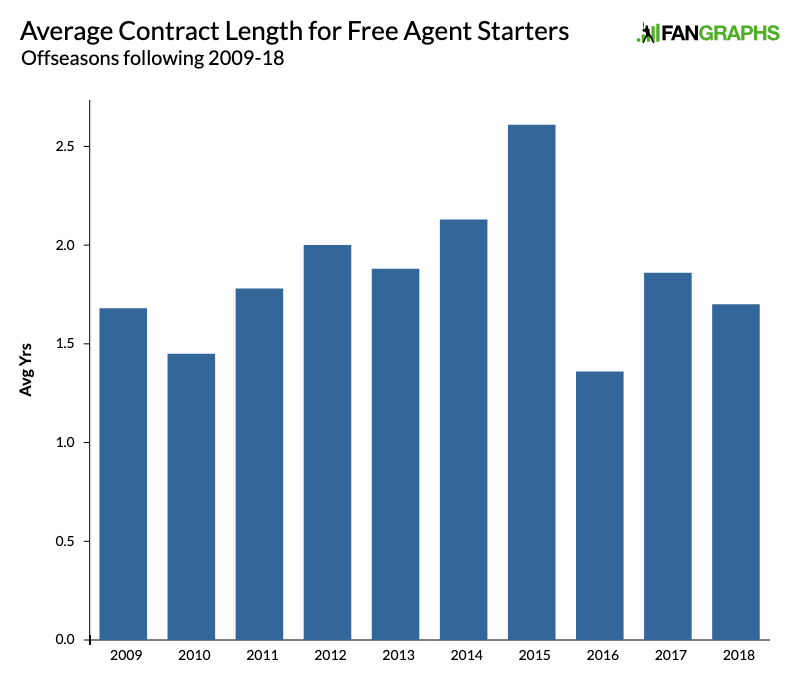 Like Craig Kimbrel, Dallas Keuchel remains a free agent — the highest-ranked one left from our Top 50 Free Agents list, in fact — his market stalled by a quest for a longer-term deal than any team appears willing to give, at least in this frozen winter market. With Opening Day fast approaching, his current situation is worth a closer look. Keuchel, who turned 31 on New Year’s Day, is coming off his best season since his 2015 AL Cy Young-winning campaign in terms of both volume (204 innings, after averaging 157 in 2016-17), and quality (3.74 ERA, 3.69 FIP and 3.6 WAR, compared to a 3.79 ERA, 3.83 FIP and an average of 2.5 WAR over the previous two years). Part of that is likely due to health, as a season-ending bout of shoulder soreness limited him to 26 starts in 2016, none of which came after August 27, while a pinched nerve in his neck, and further discomfort related to that issue, held him to 23 starts in 2017. He’s not a pitcher who misses a ton of bats, instead relying on soft contact and a ton of groundballs. Last year’s 17.5% K rate was the majors’ fourth-lowest among 57 qualifiers, and even with a fairly stingy walk rate (6.6%), his 10.9% K-BB% was still the ninth-lowest among that set. Meanwhile, he was first among that group in groundball rate (53.7%) and 15th out of 47 qualifiers (500 batted ball events) in average exit velocity (87.0 mph). Over the past five seasons, he’s second in groundball rate among pitchers with at least 500 innings (60.0%) and, for the four years of the Statcast era, 22nd out of 149 (1000 PA minimum) in average exit velo (86.2 mph). All told, Keuchel ranks 13th in the majors in innings since the start of 2014 (950.1), 16th in WAR (18.2), 17th in ERA (3.28), and 21st in FIP (3.45). Last year, he was 19th in WAR, while via our Depth Charts projections, he’s tied for 27th in WAR (2.8) based upon a 170-inning projection; prorated to 200 innings, he’d be at 3.3 WAR, but by signing late, he’s unlikely to hit that mark. That whole collection of numbers makes the case that while he rated as the winter’s second-best free agent starter (number four overall on our Top 50, just below Patrick Corbin), he’s probably somewhere between about the 15th- and 30th-best starter in the majors, less a true ace but a potential staff ace or strong number two, depending upon where he lands. Salary-wise, the range for the 15th- and 30th-highest paid starters runs from $20 million a year (Yu Darvish, Cole Hamels, and Wei-Yin Chen are actually tied for 14th in AAV according to Sportrac) and Gerritt Cole ($13.5 million), though the fact that the latter figure is a result of his final year of arbitration eligibility is yet another reminder of how vaguely salary and performance can line up. Timing plays a major part, too, and Keuchel’s timing, as far as his salary goes, has never been great. He made $524,500 in his Cy Young-winning year, with subsequent arbitration-year salaries of $7.2 million, $9.5 million, and $13.2 million. For a total of about $32 million, he provided the Astros with 18.7 WAR during his club control years. Now he’s graduated into a free agent market where even four-year deals, let alone five- or six-year deals, have become almost nonexistent. Over the past three winters, starting pitchers have snagged just five deals of more than three years, namely the six-year deals of Yu Darvish ($126 million) last offseason with the Cubs and Corbin ($140 million) this winter with the Nationals, and the four-year deals of Alex Cobb ($57 million from the Orioles) last March with the Orioles, Nathan Eovaldi ($67.5 million from the Red Sox), and Yusei Kikuchi ($56 million from the Mariners). By comparison, there were a total of 19 contracts of four years or more for starters from the winters following the 2013-15 seasons, headed up by Kenta Maeda’s eight-year deal with the Dodgers, the seven-year deals for Masahiro Tanaka (Yankees), Max Scherzer (Nationals), and David Price (Red Sox), and six-year deals for Johnny Cueto (Giants), Zack Greinke (Diamondbacks), and Jon Lester (Cubs). Some of the year-to-year discrepancy, of course, has to do with the quality of the talent available; those aforementioned long deals, and big extensions for the likes of Hamels, Felix Hernandez, Clayton Kershaw, Stephen Strasburg, and Justin Verlander, have taken a whole lot of top-tier pitchers off the market. In the winter of 2016-17, Rich Hill and Ivan Nova got the longest deals (for $48 million and $26 million, respectively), both just for three years, and the latter didn’t even reach a $10 million average annual value. Go back to the winter of 2010-11 and the runners-up to Cliff Lee‘s five-year contract — in fact, the only other multiyear pacts for starters — were Jorge De La Rosa’s three-year deal and a trio of two-year deals for Carl Pavano, Jake Westbrook and … Kevin Correa? Indeed, under the Collective Bargaining Agreement adopted in December 2016, we’ve seen a notable change in the market when it comes to the length of deals. Below are two graphs using a decade worth of data from the free agent trackers of ESPN and MLB Trade Rumors. Both resources, as handy as they are, required vetting — enough to occupy more than half of my JFK/PHX round trip while I contorted in a cramped seat, which at least passed the time better than whatever brainless Jason Statham movie I would have watched — the former because some contracts slipped by (switching to relief roles years later seems to cause misclassification, and not all contracts for players coming foreign leagues were captured) and the latter because it includes players who were non-tendered or released as well as those who signed or had their options picked up just before the free agent period started. I did include players with no MLB experience who came over from Japan, such as Kekuchi, Maeda, Tanaka, and those who had played in the majors before but were returning from a stint overseas, like Miles Mikolas. I also included many swingmen whose roles changed from year to year (Jesse Chavez and Travis Wood, for example). 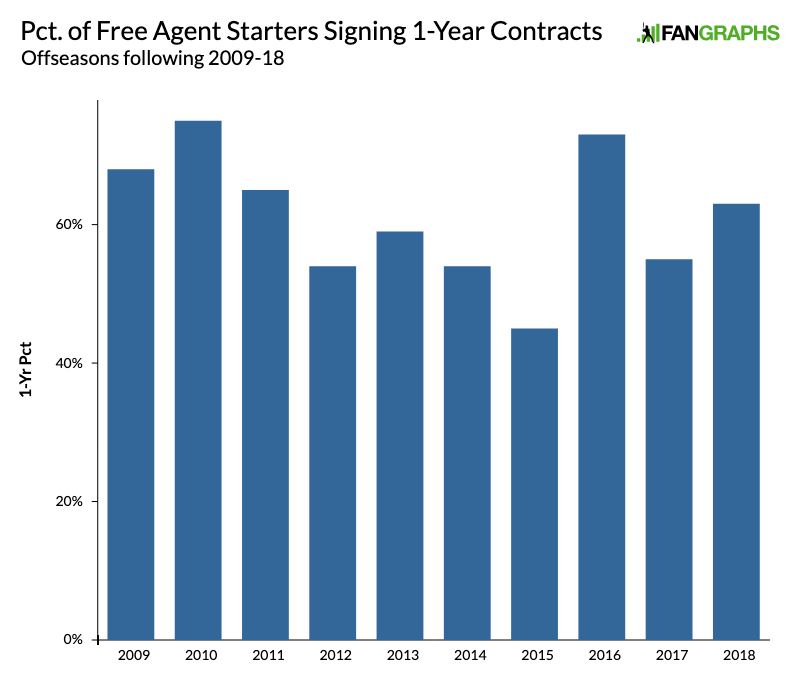 Over the past three winters, contracts for starting pitchers have averaged just 1.65 years, down from 2.19 for the winters following the 2013-15 seasons — nearly a 25% drop — and 1.76 for those following 2009-2012 (or 1.77 for 2010-12, which I note here because I had no MLBTR data to incorporate for 2009). Over the past three winters, 63% of contracts for starters have been of the one-year variety, considerably higher than the 2013-15 period (53%) but on par with the 2009-2012 period (64%, or 63% without the 2009 data), which — particularly when taken with the first graph — suggests this trend could be more cyclical than permanent. Whichever way the trend wind is blowing, it’s come at a bad time for Keuchel. For our Top 50 list, Kiley McDaniel estimated would bring home a four-year, $84 million deal, with our median crowdsource estimate coming in at four years and $79 million. Even using relatively modest values for dollars per WAR ($8.0 million) and inflation (3%), the dollar value for Keuchel’s performance via a projection from Dan Szymborski’s ZiPS system comes in slightly higher over that span, and well into the nine-figure range, though nowhere close to the $25-30 million annual range over six or seven years that the pitcher (and agent Scott Boras) were said to be seeking according to ESPN’s Buster Olney. Assumes $8.0 million per WAR and 3% annual inflation. #Astros have made both one- and two-year offers to free-agent left-hander Dallas Keuchel, sources tell The Athletic. Offers not in range Keuchel is seeking. Desired terms not known. The Astros have Verlander, Cole, Collin McHugh and Wade Miley as the front four for their rotation, with rookie Joshua James (98th on our Top 100 Prospects list) out of the mix for the start of the year due to a right quad strain. Eyeballing their depth chart, where they project to have the game’s fourth-best rotation, Keuchel would probably represent about a one-win upgrade if he threw the estimated 170 innings, which given the projected gap between the Astros (96 wins) and A’s (84 wins) in the AL West may not be great bang for the buck. In that regard, he’d make more sense for the 86-win Phillies, who project for the 13th-best rotation; he’d fit in alongside Aaron Nola, Jake Arrieta and some combination of Nick Pivetta, Vince Velazquez, and Zach Eflin, and again represent about a one-win upgrade, projection-wise. Of the aforementioned teams, it’s the 83-win Brewers, who project to have the 24th-best rotation, where he could have the bigger impact. None of the projected starting five (Jhoulys Chacin, Zach Davies, Chase Anderson, Brandon Woodruff and Jimmy Nelson) or their backups (youngsters Corbin Burnes and Freddy Peralta) are projected to provide more than 1.4 WAR, and only Chacin is a good bet to top 160 innings. Nelson missed all of last year due to September 2017 labrum surgery, while Davies was limited to 66 innings by rotator cuff inflammation, and between age and 2018 workload, there are ample reasons to be concerned about how far they can push Burnes, Peralta, and Woodruff, a trio whose inning-for-inning impact projects to be more productive than the rest. Keuchel would provide some certainty, adding about two wins to the equation while also taking a bit of a load off a bullpen that ranked second in the NL last year in both innings (614) and WAR (7.0) but already is dealing with Jeremy Jeffress‘ bout of shoulder soreness. In a tightly-clustered NL Central, where the projected difference between the top-ranked Cubs (88 wins) and bottom-ranked Pirates (78 wins) is just 10 wins, a two-win gain could be the difference between baseball and duck hunting come October. Of course, for any of the above to happen, Keuchel probably would have to settle for a shorter-term contract. Perhaps a lighter version of what Jake Arrieta signed with the Phillies almost exactly a year ago, which guaranteed three years and $75 million and could be worth as much as $135 million over five years through escalators, opt-outs, and overrides is what’s in order. Even so, among the trio of teams mentioned, it might be harder for the Phillies, who project for a $140.4 million Opening Day payroll but a $188 million competitive balance tax figure, to fit him in than it would be for the Brewers (who only project for a $121.7 million Opening Day payroll — up from last year’s $91 million — with a $143.9 million tax figure) or the Astros ($155.4 million and $182.1 million, respectively). It may take a more serious injury among one of those teams’ starters, or somewhere else in the majors, to provide the break that Keuchel needs in order to find a home for 2019 and beyond. We hoped you liked reading Dallas Keuchel Needs a Home by Jay Jaffe! I think the Twins are a good fit, too. Yes, they seem pretty committed to their approach of molding a pitching staff out of clay though. That’s safer than bringing fire, no liver-ripping eagle risk.